I'd been eyeing up this lovely looking recipe for a while and couldn't resist trying out the recipe the other day. Again it's from Paul Hollywood's latest book and although they do take a long time to make and have a few stages to them they taste absolutely gorgeous and are well worth the effort! Now..I do have to make a confession, in my eagerness to get these lovely buns into the oven and fill the house with the scent of cinnamon, orange and lemon, I did in fact leave a step out (quite an important one actually), so the final result wasn't perfect but they still tasted delicious. But hey, we all make baking mistakes from time to time right? I forgot the leave the buns rise for a 3rd time before piping the flour and water mixture and putting them into the oven, so the finished bun was a bit denser and tighter in texture than it should have been. A schoolgirl error you could say? Nonetheless, the flavour of them was absolutely gorgeous, and I can't wait to make them again. Hope you enjoy the long weekend and eat lots of yummy hot cross buns, I know I will! Yum! I find banana bread so comforting and cosy. It's not really a bread but it's not really cake either, it's somewhere in the delicious middle. A slice or two works great for a weekend breakfast with a big mug of tea, an afternoon nibble with a coffee or an post dinner treat on the sofa. I love eating it still a little warm from the oven, just as it is. My dad likes to eat banana bread with butter, which I find slightly sacrilege, but each to their own I guess! This is the Avoca recipe from their 1st cookbook, which I love and peruse through all the time. I only slightly adapted to the recipe to suit my taste, I use an organic wholegrain spelt flour and lessen the amount of sugar specified because if your bananas have been sitting on the kitchen table and getting very dark for quite a while the natural sugars will give plenty of sweetness. This is a really simple recipe to put together and is can easily be adapted to your taste. To make it a bit more decadent you could add in some chopped nuts, walnuts or pecans would work really well, or maybe some chocolate chips or even peanut butter chips (my sister has recently become obsessed with these). You could also add in more spices if you liked, nutmeg and clove would be gorgeous along side the cinnamon. I would really recommend using a wholegrain flour (I like spelt best but regular wholegrain is delicious too) instead of plain flour as it gives the loaf a nutty flavour, nicer texture and also makes it a bit healthier. I like to reserve a spoonful of sugar from the recipe to sprinkle on top of the loaf before it goes into the oven so it gets a lovely crunchy top. Although you may not associate banana bread with spring, with the awful weather Ireland is getting at the moment (rain, hail and snow storms in March!) it makes a gloomy day a bit brighter. Last weekend was my 24th birthday (Eep!! I still feel like I'm 19, 24 sounds so grown up!). I've had a few disastrous birthdays over the last few years, so I don't like making a big deal of it, however my family and Isaac made this birthday very special for me. It was also mother's day this year, and although I joked that my mum was stealing my thunder, I really liked that we got to share the day. I've said this before in previous posts, but I'm really not a very good baker of sweet things (cakes, muffins, cookies etc), so I didn't want to take any chances by making a cake! Instead Isaac took a trip to the Blackrock Market where Pure have a shop, all of their products are gluten free (brilliant for any celiacs!) and they have many wheat free, dairy free, yeast free and sugar free options available too. Isaac bought their carrot cake (how cute is the little carrot!!) which was absolutely delicious and went down very well with a glass or two of bubbles. It is full of lovely bits of carrot, is super moist and has a lovely light texture, and alright it's not a "healthy" cake but hey..it was my birthday and a teeny bit of indulgence is ok isn't it? Everyone had a slice and loved it! That evening Isaac treated me even more and had booked us a table at the Rustic Stone. I've wanted to eat here for ages but never got around to it. They have a really large menu with lots of lovely things for veggies and non-veggies alike. We started with a cocktail each, Isaac went with a classic mojito and I went with one of their specials, a pineapple and rosemary martini, both were perfectly balanced and a lovely way to wet our appetites! For starters Isaac picked the Asian quail with grilled on a stick with radish, mango and coriander. The presentation was great, showing off the ingredients well and had a lovely balance of flavours (sorry the picture is so blurry). The only small critique Isaac had was that it was a bit fiddley when trying to get the meat off the bone, but it really wasn't a major issue. For my starter I picked the crunchy salad hearts, perfectly crisp leaves each filled with a delicious fillings like tzatziki, courgette and marjoram compote, aubergine caviar and homemade chutneys. This was served with lovely sourdough bread and a thin and perfectly crunchy grissino. It was absolutely lovely, however it's definitely more of a summer dish, on a snowy March night I could have done with something a bit more warming! For main course, Isaac went with one of their "Off the Stone" burgers, the rustic lamb burger with pickled red pepper and crispy lamb fillet. This was HUGE and came with a side of chunky pesto chips. Isaac loved this, it was definitely a big manly burger, filled with delicious condiments and served on a sesame bun. Isaac asked for it medium-rare and said it was perfect. I chose the courgette linguini, which was served beautifully, a yellow courgette "poached with thyme and garlic then roasted, filled with tomato and basil and linguini rolled in chives, capers, yogurt, with baby marinated tomato more torn basil." It was absolutely delicious, all of the flavours worked perfectly together and the pasta was perfectly cooked. Although it wasn't a huge portion (in comparison to Isaac's burger anyway) I was left full and satisfied. It was a perfect way to finish off a lovely birthday and I feel so thankful to have such amazing people in my life to share it with. Here's to a great year! Sourdough bread..what can I say about it? Just...YUM! Big air bubbles, tangy flavour, great crust and amazing toasted with just about everything! I've loved sourdough for years but have always bought it in shops, never really knowing much about the process of it, other than it not using fresh or dried yeast. So I was having a look through Paul Hollywood's How To Bake book at home and thought "Why not give it a go? How hard can it be?" The answer...not at all! Sourdough has probably been made using the same techniques for thousands of years, possibly as far back as the ancient Egyptians, how amazing?! 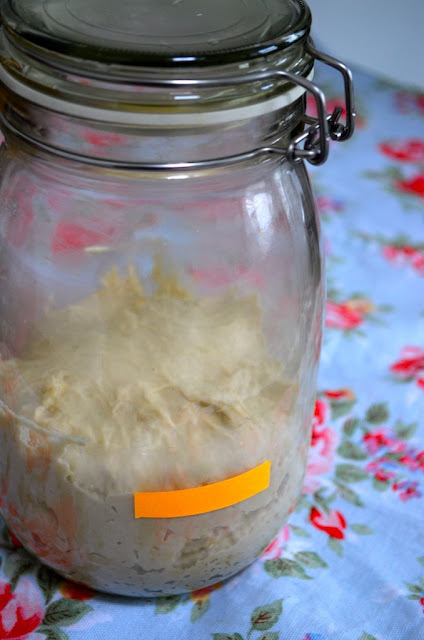 It requires naturally occurring (usually air born) wild yeasts and lactobacilli coming in contact with flour and water and over a few days fermenting into a bubbly runny mixture, called a starter. This fermentation causes the lovely slightly sour taste associated with sourdough bread. You have to cultivate the starter by "feeding" it more flour and water every few days to keep it alive and mature the starter's flavour. Once it's ready you add some of the starter to your bread mix, leave it rise, shape it, bake it and voilà you have sourdough bread! I actually never knew how many different ways you can make a sourdough starter, a quick google search will show loads of ways to do it. The usual and most common way is to leave a container of flour and water uncovered for a few days to let the wild yeasts fall into it. However the method that Paul Hollywood suggests is to use an organic apple to start the process. I'd never heard of this method but it worked out amazingly. 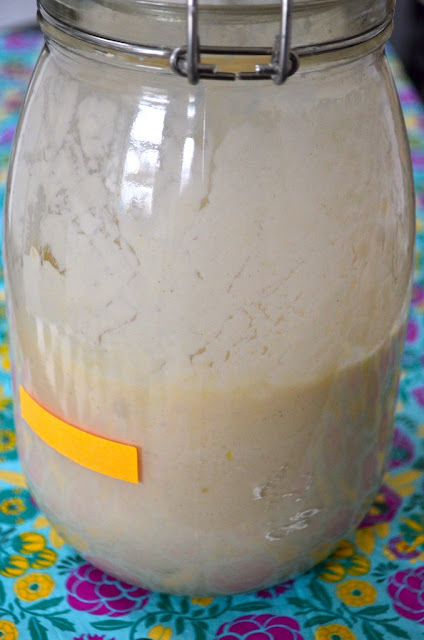 It does take time (at least a week before you can use your starter) but it is so worth it! After 3 days it should have risen up by at least double and be all bubbly (very exciting!). Once you open the jar it will make a big "whoosh" noise and smell a bit like cider, I really like this smell!! You then have to feed it, so throw half away and in a bowl add the rest of it to another 500g of flour and about 170ml of water. Yum yum! Put it back into the container and leave for another 2 days. After the 2 days it should have loads of bubbles and risen by a lot. Mine rose and fell, which is fine, meaning it was very active! If however it falls and gets kind of watery looking on top it means it's over active and needs more flour and has to be left for another 2 days. But if all is well, once again, remove half and add 250g of flour and about 200ml of water, so it's all sloppy and soft looking (like a very think pancake batter). This feel of it at this stage is so lovely to mix in your hands. Then back into the container it goes and has a little rest only for 24 hours this time. It will have risen up again and is now ready to use..yey! The recipe that Hollywood uses makes 2 large loaves. You need 750g of bread flour (plus extra), 500g of the lovely starter, 15g of salt, 350-450ml of tepid water and a little olive oil for kneading. 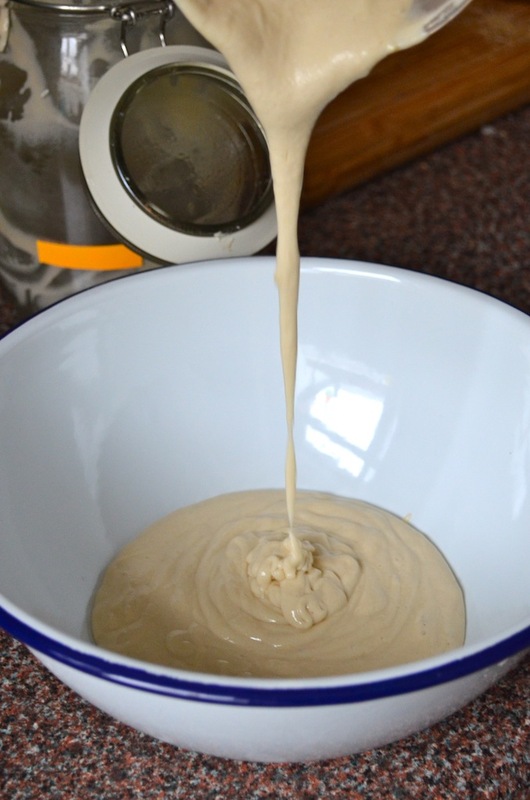 Put all the ingredients (expect the oil) into a bowl and mix until it has formed a soft ball of dough. Knead for 5-10 mins with a little oil on the work surface so it doesn't stick and becomes smooth and uniform in texture. Leave the dough to rise in a slightly oiled bowl, covered with cling film in a warm place (the day I have a proving drawer in my kitchen I will be a very happy girl indeed!). This will take a long time to rise, possibly up to 5 hours, or until it is at least double in size. Once it is risen, take it out of the bowl and knock it back until it is almost back to it's original size. You will then need 2 proving baskets quite heavily dusted with flour. Divide the dough in half and place a ball into each basket and leave to rise again. The recipe says that the 2nd rise should take 10-13 hours!!!! However I found that after 3-4 hours the dough had risen all the way up the sides of the proving basket and was ready to go into the oven. Tip the dough out of the baskets and onto floured baking trays and pop them into a preheated oven at 200C for 30-40 mins. The bread will sound hollow inside when you tap the bottom of the loaf and be beautiful and golden. Don't forget that you need to feed your starter again, another 500g of flour and about 170ml of water. You'll have to do this about every 3 days or as often as you make a loaf of bread. I know that this looks like a lot of work, but really it's less than an hour every few days and the end result is so worth it. Making your own bread is so rewarding and seeing the whole process start to finish is fantastic! 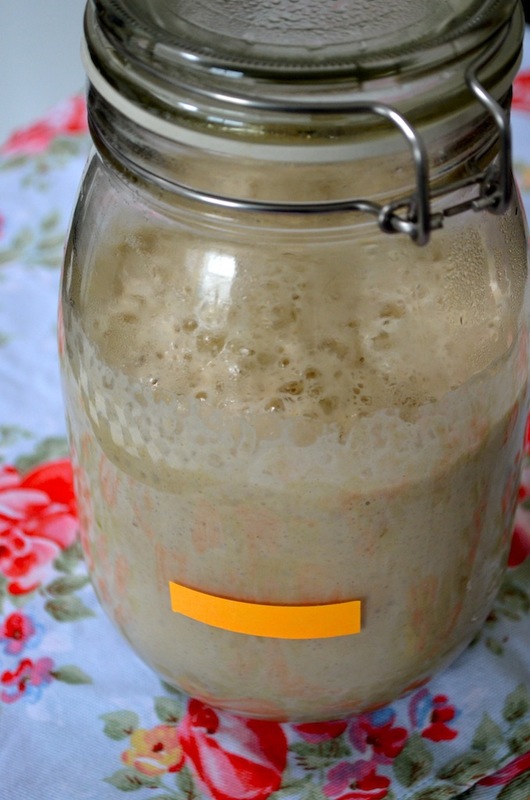 Once you start making your own bread you'll never look back and never want to buy a loaf of bread again! These are a perfect little weekend breakfast treat. I made these last weekend and they were a huge success, my family, Isaac and friend Róisín all loved them. I adapted this recipe from one I found on the BBC food website and I will definitely be making them again soon. *if you don't have buttermilk, squeeze 1/2 lemon into 280ml of low-fat milk and let it stand for 10-15 mins. If you don't eat dairy you can do exactly the same thing with a milk substitute. Almond or hazelnut milk would be delicious in this recipe. 1) Preheat the oven to 180C/fan160C and line a muffin tin with paper cases. Put the wet and dry ingredients in separate bowls and mix them, but leaving the berries out. 2) Pour the wet ingredients into the dry and work them together with a wooden spoon. Don't over mix the mixture, stir the ingredients just until they come together. Then add the berries and gently fold them through. 3) Divide the mixture between the paper cases (they will look very full, but I promise it's fine) and sprinkle with oats. Bake for about 20 mins or until nicely golden on top. Leave to cool and enjoy! These will last for about 3 days in an air tight container, and we found they almost tasted better on the 2nd day. These are perfect with a cup of tea and a lovely way to start the weekend with family and friends. If you give these a go let me know how the go. I don't think I'll get a chance to make these again this weekend as it's fully booked for me (it's my birthday Sunday along with mother's day) but I might try make them again next week!